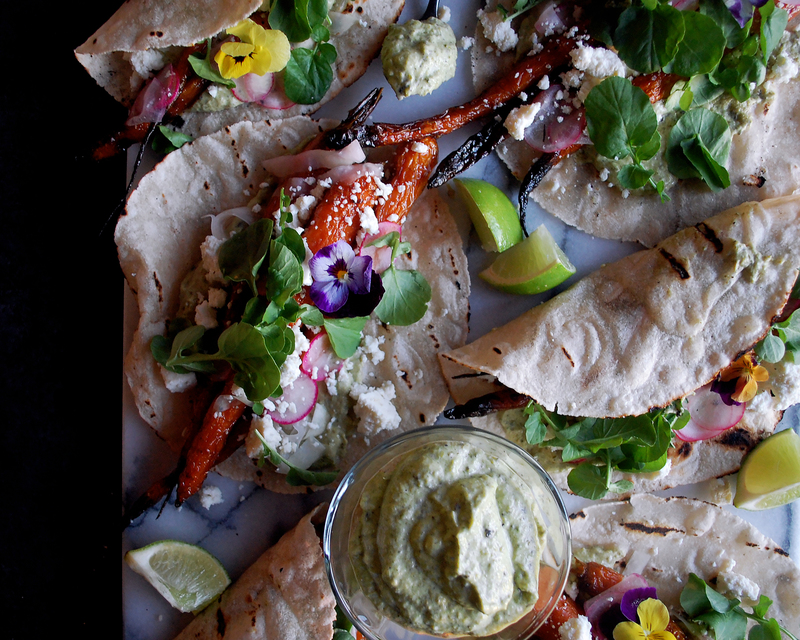 I cannot get over how good these carrot tacos are…so unique and satisfying. 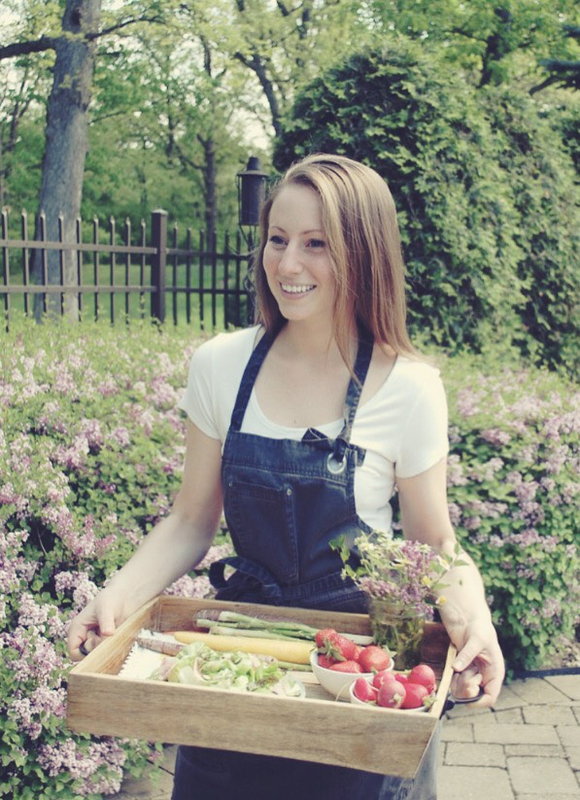 I’ve been really intrigued lately with meatless dishes, placing all the focus on vegetables, herbs, etc. Vegetables hold so much flavor and sometimes aren’t used in ways that really highlight their full potential. I thought a meatless taco would be the perfect way to experiment with getting the most out of different ingredients. I had just bought some new woodchips for the smoker, so I figured smoked carrot tacos would be a great idea. 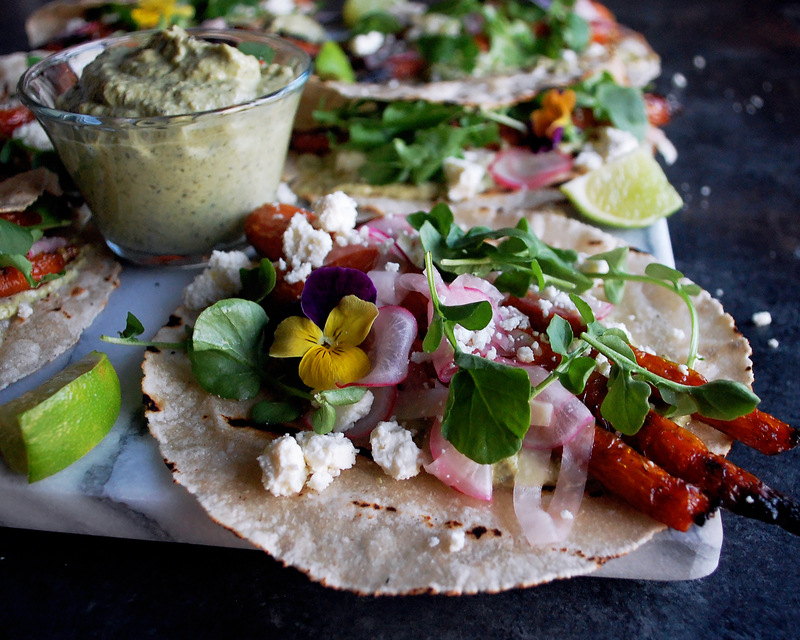 The best thing about these tacos is that they are completely satisfying, even without the meat. 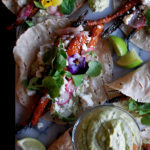 There are a few simple components, such as the fiery Poblano crème, that all come together to create a really cool flavor combination. You’ve got smoky, creamy, and tangy all in one bite, simply by using different techniques to create unique flavors. The carrots are clearly the star of this dish. I roasted them first just to get them tender and caramelized. Then, they get smoked over low heat to infuse all of that beautiful smoky flavor. I used hickory woodchips, but any other woodchip you’d like will work as well. Just by using this simple preparation, the carrots turn into something completely new. They’re still sweet, but gain a smokiness that adds such a complexity to the dish. The Poblano cream is another component where a lot of flavor comes through as well. The peppers are slightly spicy, but definitely not overpowering. I char and peel them, then blend them with Greek yogurt to create a smooth crème. 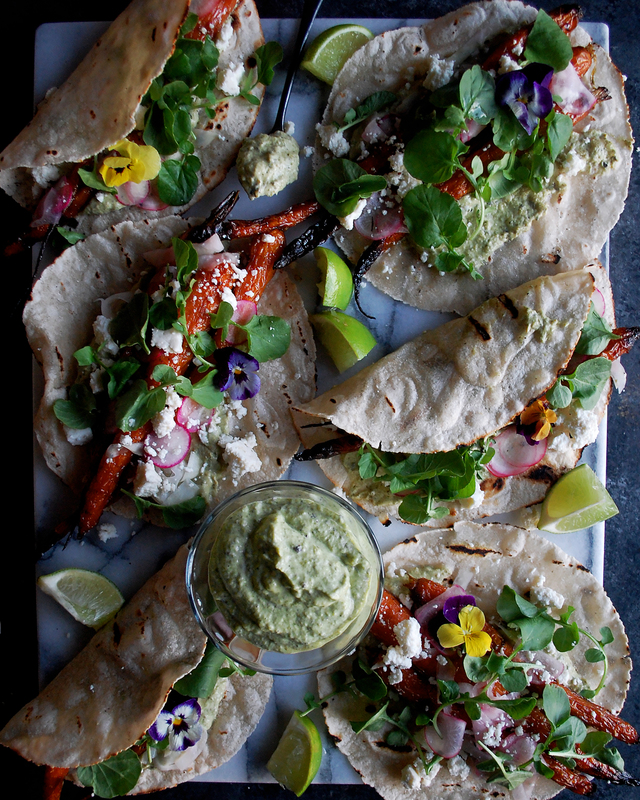 With the smoky carrots and the spicy/creamy Poblano peppers, we definitely need something tangy to brighten things up. Pickled vegetables are the perfect way to do this, and are one of the necessary components for a really good taco, in my opinion. I’ve kept the rest pretty basic. Some queso fresco, a handful of watercress, and a generous squeeze of lime. And the best part? Siete tortillas! I just recently tried their almond flour tortillas (after becoming obsessed with the Siete tortilla chips awhile back) and was pleasantly surprised again. They have a whole line of different tortillas, each variety made with different grain-free ingredients, such as cassava and coconut. I absolutely love these tortillas. They’re somewhat thin, which I find to be perfect for tacos because they really mold to the ingredients when you take a bite. They also char beautifully and have a very intriguing flavor. 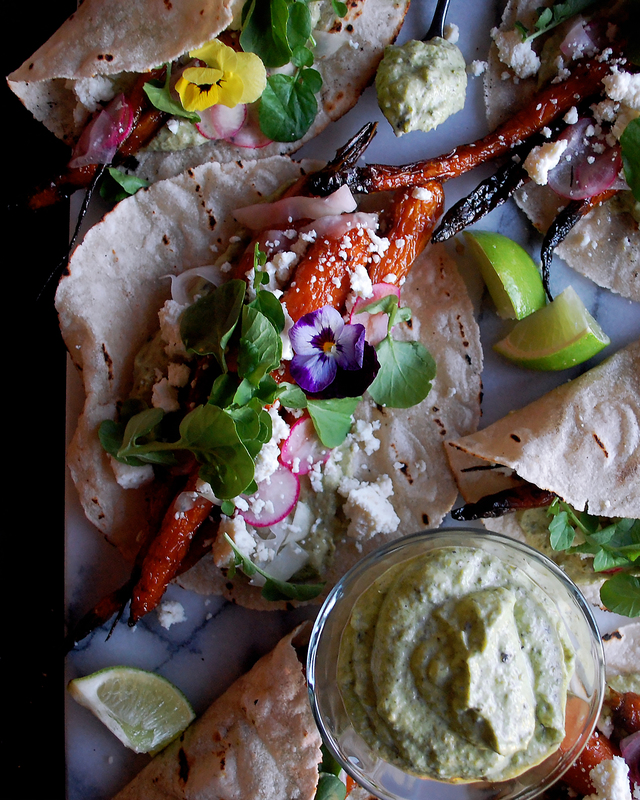 So, go pick up some tortillas and give these carrot tacos a try! I hope you love them as much as I do. Enjoy! Preheat the oven to 400F. Toss the whole carrots with olive oil and a generous amount of salt. Spread them out in a roasting pan and roast for about 35 minutes until caramelized. Prepare your smoker over low heat (I used hickory woodchips). Smoke the carrots for about 20 minutes until they’re infused with flavor. Keep warm until serving. Meanwhile, heat the grill over high heat. Char the whole Poblano peppers until they’re blackened and tender. Remove the peppers to a bowl and cover with plastic wrap for about 10 minutes. When the peppers are still slightly warm, peel the blackened skins off. You should be left with tender green flesh. Remove the cores and seeds. Add the peeled peppers to a food processor (you should have about 6oz of peppers), along with the Greek yogurt and lime juice. Process until smooth. Season with salt to taste. In a small saucepan, combine the sugar, vinegar, and water. Bring to a simmer, allowing the sugar to dissolve. Meanwhile, thinly slice the radishes and kohlrabi on a mandolin (they should almost be paper thin). Take the kohlrabi slices and use your knife to julienne them into thin strips. Add both the radishes and kohlrabi to a small bowl. When the pickling liquid comes to a simmer, pour it over the vegetables. Use a piece of plastic wrap, towel, etc. to ensure the vegetables are submerged. Let sit for about 30 minutes, or until cool. Drain before using (you can reserve the pickling liquid for other pickling projects). Grill the tortillas for a few minutes until warm and slightly charred, but still soft. 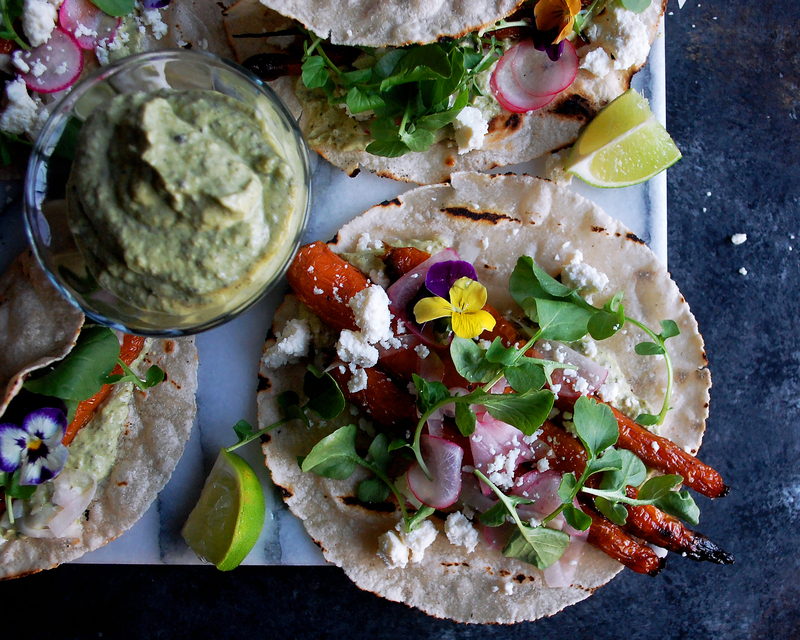 Assemble the tacos by spreading a spoonful of the Poblano crème onto the bottom of each tortilla. Place the smoked carrots on top with a small handful of the pickled vegetables. Top with a sprinkle of queso fresco, a pinch of watercress, and a squeeze of lime juice.